Although central venous catheters are prone to thrombosis and infection, many patients undergoing hemodialysis have catheters either to initiate hemodialysis or for permanent hemodialysis delivery. KDOQI Guidelines define central venous catheter dysfunction as failure to attain and maintain blood flow sufficient to perform hemodialysis without significantly lengthening hemodialysis treatment. 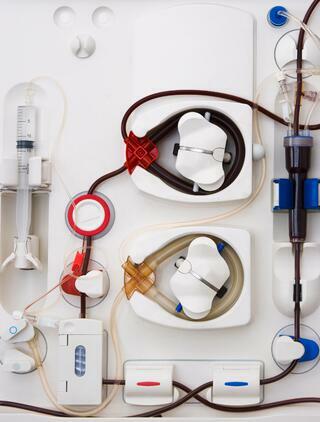 The Guidelines recommend blood flow in catheters be maintained at more than 300 mL/min for adequate hemodialysis. A tissue flap blocking the lumen of the catheter’s arterial entry port, that impedes flow and causes a severe drop in dialysis dose delivery. This can be identified via the Delivered Blood Flow Test where the nurse compares the Transonic Delivered Flow reading with the dialysis pump setting with lines in normal or reversed line configuration. If the disparity is more than 10%, kinked tubing or a tissue flap may be causing an inflow obstruction and reduced dose delivery. Check the tubing for kinks and/or reverse the dialysis lines. Again compare Transonic Delivered Flow with the machine pump setting. If the two are now within 10%, dialysis may be continued with the lines in this configuration. If a large discrepancy between the two readings persists, failure of the Central Venous Catheter may be indicated and the nephrologist should be alerted. The nurse can adjust dialysis delivery parameters (time, pump setting etc.) to compensate for recirculation and deliver the prescribed dose of dialysis (Kt/V) to the patient. Dialysis lines may be reversed to explore whether this corrects high recirculation.